Case Files or Resources aren’t words you might be using as we prepare to roll into the new year and they certainly are not top of mind for most development committees or your CEO / Executive Director. But, assessing your organization’s mission and putting together your case resource file should be part of your 2018 Fundraising Plan. January is a great month to get started or to review and update these pieces. Recently, the Cramer Team met with a philanthropic partner who is getting a jumpstart on their planning for 2018. 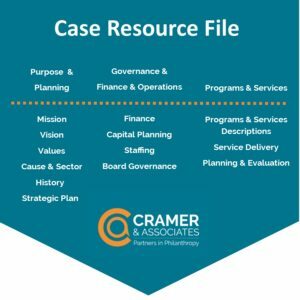 The Cramer team just completed an internal assessment and are collecting the components for the case resource file to develop the client’s case for support. “It takes time, but in the long run, the organization will be better positioned for future fundraising success if they take the time to evaluate all these elements to ensure they are conveying who they are and what they do in a relevant and succinct manner to their donor community,” explains Dawn Robinson, Senior Consultant at Cramer & Associates. An Internal Assessment reviews those key components that are necessary for a successful fund development program and provides recommendations and observations to strengthen philanthropy for your nonprofit. As the Internal Assessment review takes place, pieces are collected that are vital to developing your case resource file. A Case Resource File includes major components about your organization. Mission, Visions & Values – Double check the last time your Board reviewed your mission, vision and values. These should be reviewed about every three years. Cause & Sector – The cause and the sector is the greater need of the world or community and how your nonprofit is meeting that need. History – Whether your organization is a start up or been serving those in need for 150 years, create an engaging timeline that tells your non-profits history is important. Strategic Plan – Make sure your Board is keeping the strategic plan at the forefront. It should be a living, breathing document that adapts not only with your internal goals but with the community and the world. Finance – The numbers are an important part of the Case Resource File and should be used to create infographics and images that tell a relevant story about the programs that you have and the resources that you need. Capital Planning – If your organization has one extensive campus with buildings, or possibly multiple campuses, make sure you have put together a narrative about the planning and care for these valuable assets. Staffing – Who administers your programs is just as important. Your Case Resource File should talk about their history, their credentials and their commitment to your organization. Board Governance – Who sits on your Board is important, but WHY they chose to sit there is also important. Program & Services Descriptions – Keep a list of programs and services that your nonprofit organization demonstrate their outcomes and impact on annual basis in your Case Resource File. Program & Service Delivery – Develop a narrative about how your programs and services are delivered and challenges and opportunities that exist for improvement. Planning & Evaluation – It is important for your non-profit to develop a way to evaluate the impact your programs and services, as well as your mission impact, is having on your community and the world. Putting together your Case Resource File after an Internal Assessment will save you time when you find yourself ready to develop your case for support, case statements and case expressions. All these documents are integral when you are articulating your organization’s need for philanthropic support. Don’t let January and February slip by without starting an Internal Assessment and developing your Case Resource File.